Many consulting companies have diverse skills and as such provide consulting services in many fields. Together with Ashrei GmbH, a specialist in the area of IT Service Management, we offer you various services and provide a great breadth and depth of skills in this area. 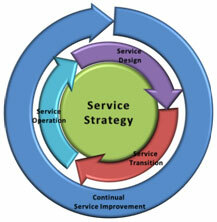 ITIL Training courses for internal IT teams, business focused IT teams and end-users. In cooperation with Ashrei GmbH (an associate of Pink Elephant) we offer courses that cover the complete ITIL syllabus. Read the OGC report on the full ITIL V3 Qualification Scheme to understand the course credit structure. Design and project management of outsourcing projects.